USA – Severe storms loom across central US this weekend – Forecasters are predicting a significant chance of strong tornadoes this weekend across a large part of the central U.S.
Wild storks observed nesting in eastern England could be the first pair to breed in Britain for nearly 600 years. The BBC reports the birds are nesting on a chimney at Norfolk’s Thrigby Hall Wildlife Gardens, near Great Yarmouth, and are engaging in mating rituals. The last stork to be documented breeding in Britain was at St. Giles’ Cathedral in Edinburgh, back in 1416. Conservation efforts elsewhere in Northern Europe have resulted in a modest return of the birds, which now appear to have ventured across the North Sea to raise a proper English brood. Sims said the gardens had been trying to get storks to nest there for many years. 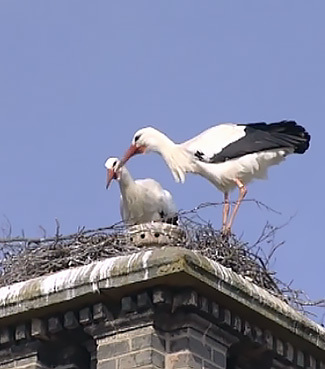 The storks nest in North Africa, across Europe and into Asia. They are known throughout the world as a symbol of fertility. 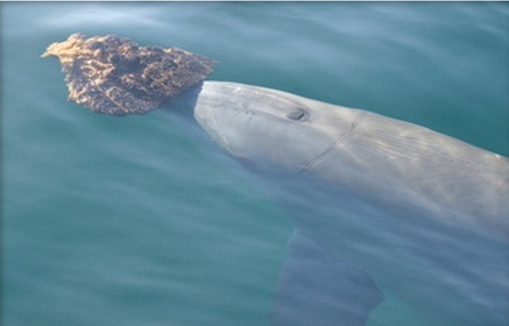 Dolphins apparently use sponges as tools to snag food they could not otherwise grab. This is the first direct evidence that dolphins can use tools to carve out unique places in the food chain. The week’s hottest temperature was 113.9 degrees Fahrenheit (45.5 degrees Celsius) at Linguere, Senegal. The week’s coldest temperature was minus 97.6 degrees Fahrenheit (minus 72.0 degrees Celsius) at Russia’s Vostok Antarctic research station. On 23, 20 and 17 April 2014, the National Health and Family Planning Commission (NHFPC) of China notified WHO of 6 additional laboratory-confirmed cases of human infection with avian influenza A(H7N9) virus. Measles has infected 129 people in 13 states so far this year, the most in the first four months of any year since 1996, officials from the Centres for Disease Control and Prevention reported Thursday. Reventador (Ecuador): A new phase of intense activity with possible lava fountains and new lava flows began at the volcano yesterday. Over the past weeks, the volcano had been in a state of mild intermittent strombolian explosions, but experienced a rapid increase in activity yesterday after around 15:00 local time. Infrared webcam images (collected by Culture Volcan) suggest that a phase of lava fountaining or much stronger strombolian explosions took place. The apparent surge in lava emission also seems to have produced a new lava flow about 3-400 m long. This increase in activity is clearly visible in the corresponding seismic signal and likely continues at the moment. Tungurahua (Ecuador): While surface activity has been fluctuating at generally low levels with only sporadic small steam and ash emissions, IGPEN reports that there are signs that suggest that a new batch of magma might be on its way to the surface. During the past days, there had only been sporadic steam emissions of up to 500 m height and 3 small ash explosions on 22 April with no explosion sounds and ash plumes not exceeding 2 km. 6.5 Earthquake hits Vancouver Island, Canada. 5.0 Earthquake hits offshore Tarapaca, Chile. 5.0 Earthquake hits offshore O’Higgins, Chile. 5.0 Earthquake hits the Kermedec Islands off New Zealand. 5.0 Earthquake hits Vancouver Island, Canada. Fuego (Guatemala): Activity has decreased at the volcano, although the volcano observatory doesn’t rule out that this is only a temporary pause and a new phase of lava fountaining and flows could occur in the near future. Strombolian explosions at the summit vent have been weak and moderate, at typical levels, over the past days. On 12 March 2014, 2 events of yellow fever were reported in the North and in the South of DRC. Six laboratory-confirmed cases with yellow fever virus infection were reported. Of these, 3 were from Bondo health zone, Orientale Province, 2 from Buta health zone, Orientale Province and 1 from Kikondja health zone, Katanga Province. In total 139 suspected, probable and confirmed cases, including 6 death were reported. On 22 April 2014, the Ministry of Health of Jordan reported an additional laboratory-confirmed case of infection with Middle East respiratory syndrome coronavirus (MERS-CoV). Bolivia – Torrential rainfall sparks flash flooding in Bolivia, leaving motorists stranded and turning city streets into rivers. At least 59 people have been killed and hundreds of thousands impacted by devastating floods in Bolivia this year. Oman – A number of governorates in Oman received heavy rainfall on Tuesday, which led to flooding in some wadis. Flash floods were reported in the wadis of Al Kahla and Al Faleej as the wilayats of Ibra and Al Mudhaibi in North Al Sharqiyah received heavy rainfall. USA – A large storm will form over the eastern half of the nation next week and will bring a swath of unsettled conditions that lasts for days. Millions of people looking for a long period of sunny, warm weather from the Midwest to the South and the Northeast will need to look elsewhere next week. The unsettled pattern will stretch from Chicago and Detroit to Atlanta, Washington, D.C., New York City and Boston. On 21 April 2014, 18 April 2014 and 16 April 2014, the Ministry of Health of the United Arab Emirates (UAE) reported an additional 9 laboratory-confirmed cases of infection with Middle East respiratory syndrome coronavirus (MERS-CoV). An outbreak of the deadly parasitic disease, African sleeping sickness, or African trypanosomiasis has been reported in Rufunsa District in Lusaka. 5.5 Earthquake hits Luzon in the Philippines. 5.3 Earthquake hits the Bougainville Region, Papua New Guinea. Tropical cyclone Jack is located approximately 350 nm southwest of Cocos Island, Australia. Tropical cyclone Jack was threatening to hamper the search for Malaysia Airlines flight MH370 on Monday, as a submarine drone neared the end of its search for the missing Malaysian jetliner in a remote stretch of the Indian Ocean. The search has entered the 45th day. Europe – Three people, including a 13-year-old boy, have drowned and two are missing in floods that hit Romania over the weekend. Philippines – Flash floods affected more than a thousand families in Carmen, Davao del Norte over the weekend. Waters quickly rose at around 6:30 a.m. Sunday, forcing 1,302 families to flee to higher ground. As of 18:00 on 17 April, the Ministry of Health (MOH) of Guinea has reported a cumulative total of 203 clinical cases of Ebola virus disease (EVD), including 129 deaths. To date, 158 patients have been tested for ebolavirus infection and 109 cases have been laboratory confirmed, including 61 deaths. In addition, 41 cases (34 deaths) meet the probable case definition for EVD and 53 cases (34 deaths) are classified as suspected cases. Twenty-four (24) health-care workers (HCW) have been affected (18 confirmed), with 15 deaths (11 confirmed). On 18 April 2014, the Ministry of Health of Greece reported 1 laboratory-confirmed case of infection with Middle East respiratory syndrome coronavirus (MERS-CoV). In Equatorial Guinea, three new wild poliovirus type 1 (WPV1) cases have been reported on 14 April 2014, the first polio in the country since 1999. Genetic sequencing indicates these cases are linked to an ongoing WPV1 outbreak in Cameroon which has subsequently been detected in Equatorial Guinea. The cases had onset of paralysis on 28 January 2014, 19 January 2014 and 24 March 2014, from Centro Sur, Bioko Norte and Litoral. Outbreak response in Equatorial Guinea is currently being planned, including National Immunization Days (NIDs) with bivalent oral polio vaccine (OPV) on 21-24 April 2014. An estimated 40% of children are fully immunized against polio in the country.